It's popular in certain circles to say that the Russians were the real pioneers of spaceflight and that all the Americans really did was get to the moon first. Well, Russians were the first man and first woman in space, and they did manage the first space-walk, but the US was not far behind in these feats and went on to a string of firsts including the first real docking of spacecraft, the first manned lunar orbit, the moon landing itself, the first re-usable space-craft, and much greater success in interplanetary exploration than the USSR. But in one area I think we can truly say the Russians were the leaders is orbital space stations and long-term habitation of space. Russians fill 31 of the top 33 slots on the list of longest total experience in space and the USSR/Russia has a total of over 17,000 cosmonaut days in space, compared to just over 10,000 astronaut days for the US. The US had Skylab, of course. But the USSR was first with Salyut 1 and had the whole Salyut series of space stations and ultimately the amazing MIR space station. It weighed 100 tons, went into space in 1986, and was the first big modular space station (the second, and only remaining one, is the International Space Station). MIR cosmonauts (and later visiting astronauts) established all kinds of long-stay records and survived all kinds of near-disasters: fires, robot spacecraft collisions, and post-USSR, perpetual worries about whether the Russian space agency had enough roubles to send a rocket to bring the cosmonauts home! Towards the turn of the century, MIR was on its last legs. The Russians apparently proposed that its modules could be refurbished to form the basis of the International Space Station. NASA refused. Legitimate concerns about safety, or American hubris? Take that for a spin at your next dinner party (of course, your friends will probably get up and leave saying "Nice party, poindexter"). By 2001 the writing was on the wall. A period of useful but tense Russia-US co-operation on MIR had ended in 1998. Later efforts to commercialize MIR had come to nothing, and so on 23 March 2001 the whole space station was deliberately crashed into the earth's atmosphere, breaking up in a spectacular fireworks display over the South Pacific. These days the Russians and the Americans work together on the International Space Station, getting regular visits from the Space Shuttle, when it flies, and from Russian spacecraft. It has hosted the world's first "space tourists", most recently and probably most photogenically Anousheh Ansari, the Iranian-born American telecoms entrepreneur. But for me, MIR is somehow more romantic than the ISS - seemingly stuck together with tape and a good dose of hope, catching on fire one day, running out of power the next, crashing with its resupply ship on the weekend but somehow still flying on Monday, year after year for 15 years.
. world's only flights from one space station to another (a Soyuz flew from MIR to Salyut 7 on 6 May 1986 with 2 cosmonauts and returned to MIR 50 days later). I'd wanted the MIR kit for some time and when my amazing wife actually found a hobby store in Beijing, I saw it and bought it straight away. Luckily for me the Chinese "net nanny" had liberalized the Great Fire Wall for a week or two and so I could get onto wikipedia and read all about my new space station and its Salyut ancestors. Now, of course, the requirements of the Harmonious Society have mandated the re-blocking of wikipedia - but not before I learned all about this space station. 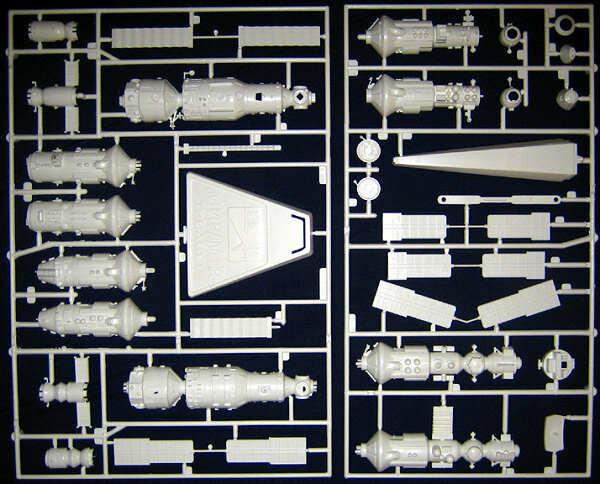 In 1:144 scale, the completed model will be about 23 cm across. There are only 33 parts, nicely moulded with no obvious problems. Detail is reasonable - what is there is good, but even copying from the box art the modeller will be able to make his or her kit a lot more interesting. The truly dedicated, and capable, will want to replace the solid-moulded large antenna and the solid-moulded girder-construction instrument pylon. The solar panels - 16 of them - are probably too thick but if they are painted well to capture the blue-gold reflective appearance, I think the thickness won't matter, especially because it has the added benefit of not being too flimsy and easily snapped off the completed kit. The kit includes a Soyuz spacecraft to fly your cosmonauts back home, and an automatic Progress supply ship to bring them fresh food and more electrical tape to hold the station together. These are only the size of my thumb but could benefit from some detailing. It also has the docking module for the Space Shuttle, so if you get a 1:144 orbiter you can deliver some astronauts too. That would make a rather awesome display piece. There is a display stand which takes the kit's only decal. I'm not convinced it will be sturdy enough to hold the whole thing safely, though. I have test fitted one module and it looks like construction will be straightforward and without too much pain (the kit was made in 1998, after all). To get a great looking MIR, I think the modeller will really need to shine in the finishing department. Subtle shading on the mainly white modules will create a realistic appearance (apparently the white coatings turn brown after prolonged exposure to the sun). With some skill, I think the solar panels would look fantastic and reflective. I have already consumed a large amount of chocolate testing out different gold foil to simulate the gold-mylar insulating material on one of the modules (so many sacrifices must be made in pursuit of this hobby!). Unfortunately I lack most of the skills just described - except for chocolate eating - and in my temporary home in Beijing I don't have any of my normal modeling materials. I plan to build this up in such a way that one day, when I return home, I can rebuild and detail it. 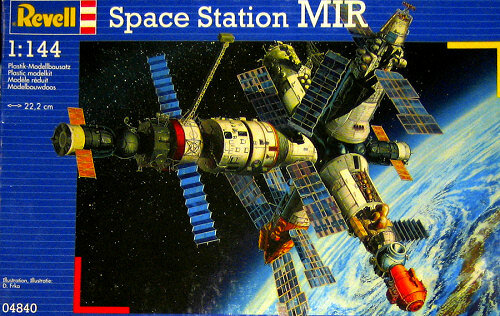 If you like real space, I think you can't do without a model of the amazing "space station that could": MIR. and lots of other websites via google and links from those above.